MILAN (Bloomberg) -- Fiat S.p.A. named Agnelli family heir John Elkann to become chairman as Italy's biggest carmaker prepares to spin off the auto unit from truck and tractors. Elkann, 34, will replace Luca Cordero di Montezemolo in the top position, the Turin-based company said. Fiat has revived a plan to separate the car division, according to two people with knowledge of the matter, who asked not to be identified prior to an announcement. 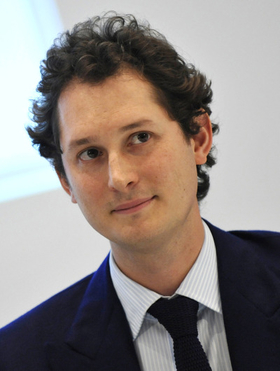 Elkann, the grandson of former Chairman Giovanni Agnelli, is currently Fiat vice chairman and head of the family's holding company. With a separation of the auto operations, CEO Sergio Marchionne would have an entity to facilitate future alliances, and a share sale would generate cash to expand. The unit accounted for 56 percent of 2009 sales. “The spinoff is very positive for Fiat as it helps to bring out the value from the Italian carmaker,” said Karim Bertoni, who helps manage $18.5 billion at Geneva-based Banque Syz & Co. “That's why shares are moving up. Banks have been asked for funds to help finance the spinoff, which the company may complete before the end of the year, another person said. A Fiat spokesman declined comment. Marchionne has said only the largest carmakers will survive in the long term and has sought to grow Fiat through acquisitions. Fiat bought a 20 percent stake in Auburn Hills, Michigan-based Chrysler LLC in June, helping the third-largest U.S. carmaker emerge from bankruptcy. The CEO unsuccessfully bid last year to buy General Motors Co.'s Opel unit in Germany. Fiat Automobile, not including Fiat's Chrysler stake, is worth about 6.5 billion euros ($8.5 billion), or 53 percent of Fiat's market value, said Stephen Pope, chief global strategist at Cantor Fitzgerald in London. Elkann, a native of New York who was raised in the U.K., Brazil, France and Italy, is chairman of the Agnelli family holding company Exor SpA, which controls 30 percent of Fiat. He was designated by his grandfather to succeed him as the leader of the family's businesses. Elkann was left with control of the family business when his grandfather, Giovanni Agnelli II, died. Montezemolo, who will remain chairman of sports-car maker Ferrari S.p.A., said his resignation is unrelated to a possible spinoff. No one will replace Elkann as Fiat vice chairman, Fiat said. Chrysler is refreshing most models, including the Jeep Grand Cherokee. New Chrysler 300s and Dodge Chargers will use the first platform developed jointly with Fiat, which plans to begin selling its 500 subcompact in the U.S. Marchionne has said Chrysler may have an IPO after 2010. Marchionne told reporters at the Geneva auto show March 3 he would resolve the question of whether Fiat plans to spin off its auto unit at the presentation of its new business plan. Montezemolo said the same day a spinoff wasn't on the table. Fiat derives its revenue outside of autos from units including truckmaker Iveco S.p.A. and CNH Global NV, an agricultural and construction machinery maker. The separation of its auto unit from the truck making and agricultural machinery units could also be achieved by spinning off CNH, one of the people said. The Agnellis are one of Italy's richest families, holding a 59 percent stake in Exor, whose investments include Fiat and Juventus Football Club SpA. Elkann says he was left with control of the family's business assets when his grandfather, Giovanni Agnelli II, died in 2003. Elkann has carried on the patriarch's sporting lifestyle, spending 2.5 million euros of his own money to buy a racing yacht named Ericsson 3. He's using the sailboat to enter an Italian team in the Volvo Ocean Race 2011-2012. Elkann decided to buy the racer in 2009 after a nine-day venture across the Atlantic Ocean with his skipper, Giovanni Soldini, on the Stealth, a black yacht that Gianni Agnelli had built.